If you are anything like me you probably had the dates for Lotusphere 2012 inscribed and blocked in your calendar as soon as they were announced last year and spend the last 11 months bugging your boss about letting you go (yes, I did). Still, not everyone gets to go….. DISASTER!, now what?!? How can you NOT be there where it is all happening!?! Keep an eye on central sites like the Lotusphereblog and official IBM Lotusphere site for relevant links, news and updates. Check out the #ls12 hashtag. Anything going on at or around Lotusphere will in general be tweeted with this hashtag. Even better, check out the IBM Social Aggregator for Lotusphere site that lists tweets & blog posts about Lotusphere all in one convenient web page with link backs to authors profiles and other blogs. Listen to the podcasts that are around. There are several out there like Taking Notes and This Week in Lotus for instance that are really worth listening to if you want to know what’s going on in the Lotus Community. Leading up to and during Lotusphere they tend to do lots of interviews and even live recordings from the conference itself. Check out PlanetLotus. The place to go for all blog’s Lotus and during Lotusphere the place to get the latest scoops. Check out the Greenhouse Lotusphere Community (register for free with Greenhouse if you haven’t done so yet to get access). An online Connections community where people can connect, post pictures, links and video’s, search for information, post questions and get involved while at Lotusphere. But also open to anyone not there. Follow and connect with people on twitter that are there. This is the best way of getting to know what’s going on. Who to follow? Well there are lot’s and finding the right ones can be difficult if you’re new to this. A good basic set of active Lotus community tweeps is to simply follow the IBM Champions twitter list. These are some of the most active members in the community and it’s an easy starting point to broaden your network. Don’t be afraid to interact with them either. These are people that were recognized by IBM for their active role in the Community so in general they are really open and willing to engage with you. This list is far from complete. Any more tips I might have forgotten? Add them to the comments! It’s getting close to Lotusphere. The excitement is building up with the session overview being announced today and less then a month to go till OGS! Busy times especially for the speakers who’s slides are due any day now. Not selected as a speaker? There is still a chance for you too. The “NERD101: Spark Ideas, featured by the Nerd Girls” gives everyone that has an inspiring story to tell a chance to be on that Lotusphere stage! There is a new type of session at Lotusphere this year and the speaker is….. you! Spark Ideas is session in which we bring together a group of people to discuss what inspires us. Lead by Kristen Lauria, Vice President Marketing for IBM Social Business, a group of speakers will share their experiences, inspiration, challenges, etc., during a compilation of five minute talks. Want to participate? There’s still time to submit your abstract! The topic can be anything that you feel is relevant from how you were inspired by your math teacher to go into computing, a unique personal experience or story, how you juggle your busy job and coaching little league soccer, or describing your hobby or family project. Whatever you think would inspire your colleagues and friends in the room! So don’t hesitate if you feel you’ve got something to contribute. How?? To sign up, simply send your abstract (maximum 500 words) to info@nerdgirlgroup.com with a short bio telling us who you are. But be quick because time is running out! Submit your abstract by December 19, 2011. Final selection of abstracts will be made public in the beginning of January. We hope to see you in January in Orlando, let’s Spark! Ok, so there’s a first time for everything and this week it was being a guest on the This Week In Lotus podcast discussing the Redbook Residency, abstracts and NerdGirl activities at Lotusphere 2012. It was nervewracking…. Lets say that some great editing by @StuartMcIntyre and @DarrenDuke eventually saved the day. Still, had lot’s of fun doing it and it accounted for some great bloopers (included in the last 3 minutes of the podcast). So I’m going to Lotusphere 2012…Yeah!!! Ok, I understand probably not very exciting to you but for me it is. And I’m looking forward to it!!! One of the things I’m particulary looking forward to is the Nerd Girls “Great Geek Challenge”. A battle of the Geeks and THE moment for the community to glorify it’s geekiness and have some fun. Ok, yes, overdoing it a bit here but just love the geeky thing. Check out Gabriella Davis blog on Turleweb or the Great Geek Challenge site for more details. This is one ‘session’ you shouldn’t miss! Didn’t have a change to go to Lotusphere this year? I’m not there….. Unfortunately but that’s live isn’t it?! 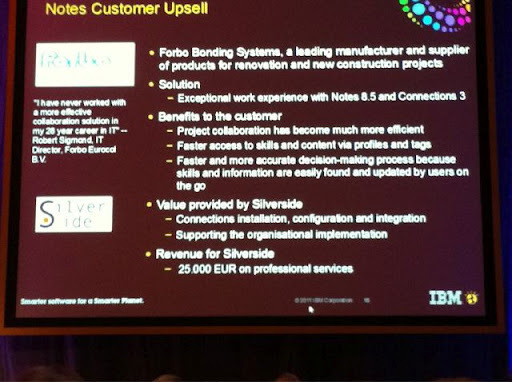 Some of my colleagues are though and at the Business Development Day yesterday they got a really nice surprise when IBM used Forbo’s (one of our customers) Connections cases as an example in their presentation. Thanks to @marceldehoog for the picture!